"Taormina Greek theatre is the most remarkable of Taormina monuments in the shade of Mount Etna Volcano "
When a cruise ship docks in Messina…Taormina bustles with visitors… streams of people pour along Corso Umberto, and then down the Via Theatro Greco. It’s clear everyone has only one goal in mind: to see the famous Taormina Greek Theatre, the most remarkable of all Taormina monuments. Although it’s not the only one, or the biggest Greek theatre (the other one is in Syracusa)… the Taormina amphitheatre is so well known for its unique position. Sitting in this theatre, today or 2000 years ago, you could not only enjoy some Greek drama or Roman gladiators’ shows… you could also enjoy the spectacular views of the deep blue seas of the Bay of Naxos and Mount Etna volcano. Taormina Greek theatre was fist started by Greeks in the 3rd Ct BC, which we can tell by its plan and arrangement. Also, there are still some remains of the Taormina stone blocks below the scene of the theatre, which were typical of the ancient Greek building technique. However, in the 1st Century AD, when Taormina was a Roman town, the Taormina Greek theatre was rebuilt in brick by the Romans who needed more space for their barbaric shows. 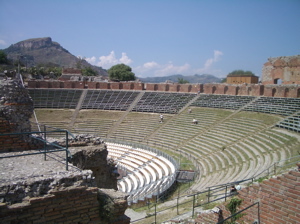 This Greco Roman theatre of Taormina is divided into 3 main sections: the scene (the backstage area where the actors could change their costumes or masks; it was also used as the scenery backdrop), the orchestra (the site of the choral performances, religious rites and acting) and the cavea (the seating for the spectators as well as the subterranean cells in which the wild animals were confined before combat). The theatre could seat about 5,400 spectators. Today, thanks to its fantastic acoustics, Taormina theatre is still used as a setting for concerts and festivals.